Old enemies return... Ayane Isuzu, a high school student, also works as an invader hunter for the AEGIS Network run by the mysterious tycoon, Reiji Kageyama. 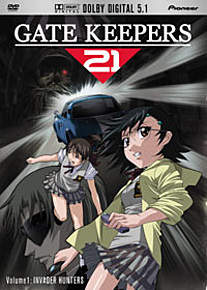 Ayane attempts to recruit her classmate Miyu, but once Miyu discovers that the Invaders are humans, she tries to go back to living a normal life. Meanwhile, relentless attack by the invaders lead by the mysterious Ghost Girl and the revived Kaiser Kikai continues. Why is Ayane reluctant to use her gate - a legacy of her father, Shun Ukiya? DVD Features: English and Japanese 5.1 Audio, Clean opening animation, reversible cover, and Previews.